Ric Flair’s Last Run Derailed? I confess to no longer watching wrestling, having long ago lost interest in the current product, both WWE and TNA. But Ric Flair continues to be the common thread that links us from today back to 1974, when Flair first made a big splash in the wrestling business right in front of Mid-Atlantic Wrestling fans. He took the wrestling world by storm, and hasn't let it go yet. I suspect many of you don't watch the current product either. But I think we all still have an interest in the Champ. So occasionally Jim De Medeiros will update us on what's happening with our hometown boy, the "Nature Boy" Ric Flair. 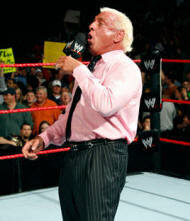 On November 26, 2007, Ric Flair returned to the WWE and began his last run. The plan, originally envisioned by Steve Austin, was for Flair to appear on all three brands of the WWE. However, something changed. While Flair was originally slated to appear on the December 3rd Raw tapings, as well as the December 4th Smackdown/ECW tapings, the plans were changed. Apparently, for reasons that are unclear, the entire angle may have been dramatically altered. Flair was left off that week’s shows altogether. He returned on December 10th’s Raw Anniversary show for the Evolution reunion. A visibly distracted “Nature Boy” took part in a six-man tag match, while Jim Ross announced in passing that the stipulations to Flair’s retirement have been changed. Now, Flair only has to retire if he loses in a singles match. The way the stipulation changed is certainly cause for concern amongst the Flair faithful. Rather than having owner Vince McMahon make the proclamation, the play-by-play announcer did so, which could be signaling the downplaying of the storyline. Perhaps the greatest test to this theory will occur on December 18, 2007 when WWE tapes its Smackdown program. WWE has promoted this taping to feature Ric Flair wrestling in a career-threatening match. If during the course of the program, they announce that the Flair appearance is a special cameo, then the angle will probably be given a chance to develop as originally intended. However, if they announce that Flair has once again become a Smackdown wrestler, the message is very clear that WWE no longer views Flair and the angle as profitable. The notion itself is mind-boggling. Television ratings certainly would indicate the contrary. On the night that the angle was launched, ratings increased from a 3.41 to a 3.67 as the night progressed. If nothing else, the growth proves that people were into the story and wanted to see if Flair’s career would continue after his main event match against Randy Orton. The following week without Ric Flair on the show, ratings plummeted to 3.24. Some critics claim that Flair’s less than stellar performance in the match against Randy Orton may have something to do with downplaying the story. However, it should be noted that the performance may have been playing into the storyline. After all, in order for the story to properly climax, the opening stages must feature Ric Flair appearing to be well past his prime and without a chance. The fact that Flair hadn’t wrestled a match in over three months was undeniably also a factor. Flair himself had stated in the weeks prior to the match that it would take him a few weeks to shake the ring rust. Regardless, the match against Orton told the story that needed to be told quite well. Flair opened the match with perhaps the worst chops of his career. As the match wore on, his performance improved. However, viewers were left with the impression that not only was Flair battling against insurmountable odds, but he was also in a losing battle against time. In a sense, this was the ideal way to begin the Rocky-like storyline originally conceived by Steve Austin. Flair Promises to "Go Out in a Blaze of Glory"